Friday afternoon and I was exhausted. My body battered from the weeks taco extravagance and an unfortunate tumble on the basketball court that has left your humble taco correspondent in less than optimal condition to be on the taco beat. I couldn’t wait to get home and throw off my shoes, ice my ankle, and pop Season 1 of True Blood (yeah I just started watching, don’t tell me what happens). I drove west on Pico out of downtown LA. It was still daylight and my prospects of finding a taco truck on Pico were not that great. 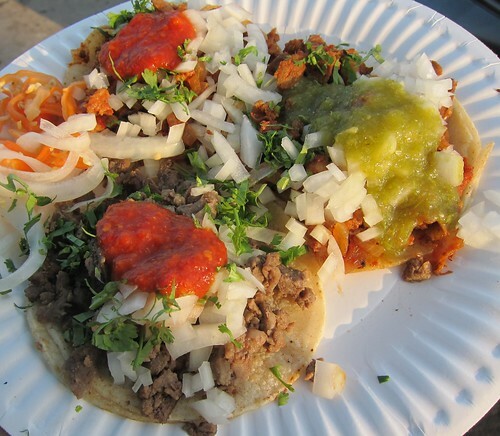 I recalled that I had once seen a taco truck outside the Smart & Final in Pico Union(there’s always a taco truck outside a Smart & Final) so my first plan was to check there and then if I had no luck to take Western up to the Koreatown taco trucks. As luck would have it there was a taco truck outside the Smart & Final. 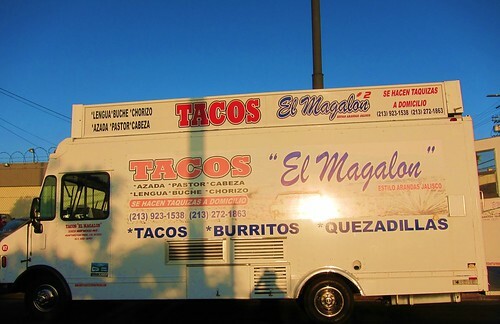 The trucks name was Tacos El Magalon. I hobbled up to the counter and ordered two tacos al pastor and one taco asada. Behind the glare of the taco truck glass I could see an al pastor spit. They had no jarritos and the jarrito - burrito thing happened again. They had horchata though for $1 so that’s what I went with. 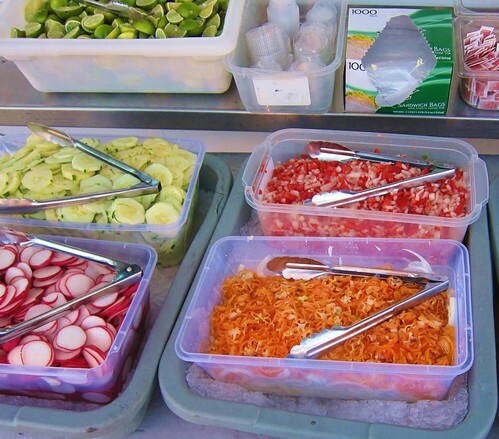 The salsa bar was stocked with three salsas and plenty of condiments to garnish your tacos with. The habanero onions were ridiculously hot. Usually this dish has no habanero seeds and more onions than habanero but this had more habanero and had seeds. I rolled up one of the habanero rings into one of my tacos and afterwards I couldn’t get the horchata down fast enough. I like tacos that come on the plate with a hot tortilla and hot meat. I like it when they taste like they just came off the grill. These tacos were kind of cold. I didn’t see the taquero cut from the al pastor spit and the pork tasted like it had been cut from the spit then left in a container. When you are busy you can get away with those kind of short cuts but there wasn’t anyone in line but me. The asada was the same. It didn’t taste like it recently came off the grill. The salsas were wonderful though. The salsa verde had a nice kick to it and reminded me of the salsa verde from Cactus taqueria. 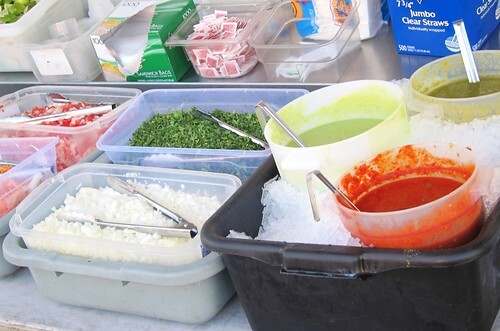 The bright red salsa roja was really vibrant and flavorful and had a slow building heat to it. There isn’t a lot of taco truck competition in this area. Surprisingly Pico Union is kind of a dead zone when it comes to taco trucks. When there isn’t a lot of competition I’ve noticed that some taco trucks cut corners. I know Tacos El Magalon has the potential to make tacos better than this. But tonight they just weren’t very good.